Daily — Mon-Thu: 8:15 a.m.
St. Stephen Martyr parish was established with about 350 families from the neighboring parishes of St. Elizabeth of Hungary, Our Mother of Sorrows, and Holy Family. The parish serves Catholics in the central Louisville area. Founding pastor Father Clemens Weiker took up residence at Our Mother of Sorrows rectory in 1948 and began preparations for building the parish church and school through soliciting donations from prospective parishioners. Parishioners purchased a prefabricated structure to serve as the rectory. For a convent, they converted a building that had been used by the Camp Taylor Army Post as a World War I hospital. Construction of the parish church and school began in 1949, and the Dominican Sisters from Saint Catherine, Springfield, Kentucky, taught in the school. The school’s auditorium served as a temporary church, until an L-shaped church with a seating capacity for 600 was completed and dedicated in December 1950. The 1950 church was attached to the school, and eight classrooms were added in 1954. The school reached its peak enrollment—more than 700 students in the 1960s—with lay teachers and Dominicans staffing 16 classrooms. In 1970 when the Dominican Sisters left the school, the parish formed a parish school board and hired its first lay principal. In addition, the parish began religious education classes for the children of the parish who attend public schools. A new church with theater-style seating in a semicircular configuration was constructed and dedicated in 1982. 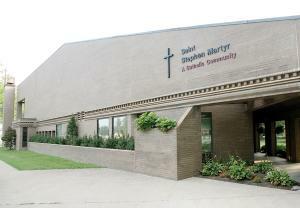 In 2000, the parish began a capital campaign, raising $2.1 million to renovate the old church, then the gymnasium, into a junior high wing for the school. In addition, the capital campaign enabled the community to build a new parish activity center with space for a children’s day care center, gymnasium, offices, meeting room, and a kitchen. Now with over 2,500 parishioners, St. Stephen Martyr Parish continues to be a vibrant parish that is committed to serving the local community’s poor and needy.